On October 28, we had our second membership meeting at Edgehill United Methodist Church with over 70 people. At the meeting, we talked about how principled organizing to dismantle white supremacy begins with shared analysis of the problem – What is white supremacy? How do we talk about it? How does it operate? What upholds it? We did two small group exercises to get us talking about these questions. 1) We looked at terms and definitions related to anti-racism, discussed the meaning of the words we use every day, and wrestled with differences between equality vs. equity, racism vs. prejudice, etc. 2) We used the image of a building being held up by pillars and asked ourselves: If the building is White Supremacy, then what are the pillars that uphold it – what institutions, policies, and practices keep White Supremacy intact in Nashville? 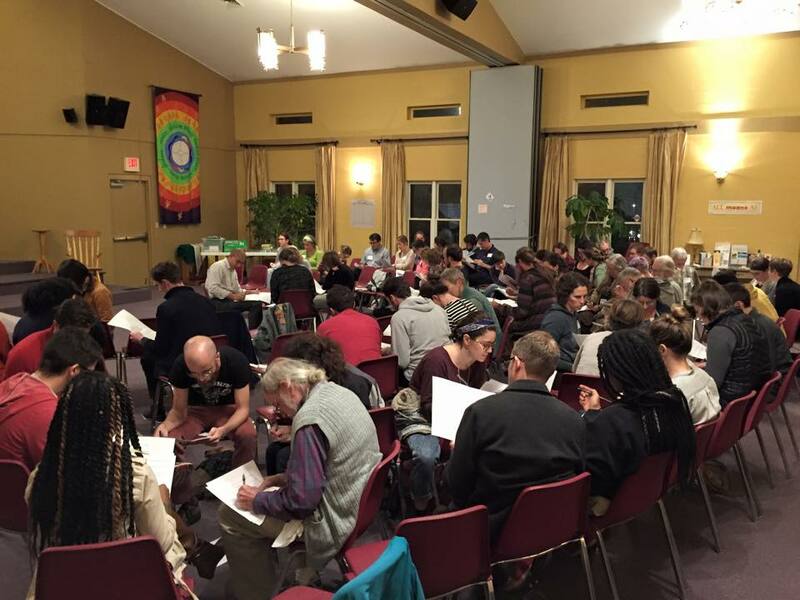 Small groups explored everything from the prison system to gentrification to wage inequality. Then, we asked ourselves: Which of these pillars is the most vulnerable? Which one could we smash? We asked participants to reflect on these questions keeping in mind the communities, networks, and resources they are connected to. If you would like copies of the handouts, please email surjnashville@gmail.com. Please feel free to return to these resources and use them! Over the next few weeks, the SURJ Nashville steering committee will take a look at the pillars activity work that small groups produced, the post-it notes with the communities members are connected to, and begin to map out potential targets and the resources we have to attack them. Keep an eye out for opportunities to participate in this ongoing analysis and conversation. Our next official membership meeting will be in January, but we want to invite SURJ members to attend the December 5 workshop on cooperative economics (details below). NOW: Workers’ Dignity – a low-wage worker center in Nashville – is starting a worker-owned radio station! Contribute to the Kickstarter campaign here. FRIDAY Oct 30: #TNisNotforSale Delegation to Govenor Bill Haslam. 11:30am at the State Capital in Nashville. Governor Bill Haslam is pursuing a privatization plan that would outsource all of building management for state-owned real estate. That includes every state university, hospital, prison, state park, and all other state-owned facilities. It could cost 10,000 Tennesseans their job and impacts working class women and people of color the most. SATURDAY Dec 5: CoopEconNashville: Reclaiming our economy through community ownership. 8:30 am – 5:30 pm at Tennessee State University: Avon Williams Campus.Join us for a gathering of neighbors, laborers, organizers, activists, faith leaders, and city officials for a day of learning, planning and organizing towards democratic ownership of land, business and other resources. The day will include presentations from existing cooperative enterprises and institutions, small-group workshops, community asset mapping and focused strategy sessions. More info and REGISTRATION LINK here.